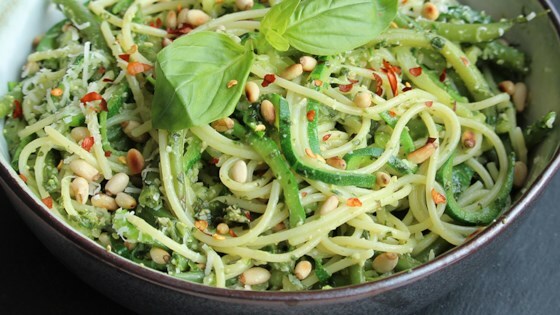 "Spaghetti with pesto taken to a new level. Adding spiralized zucchini and fresh green beans adds nutrition and fun to this vegetarian dinner." Bring a large pot of water to a boil over high heat. Add salt and green beans. Simmer 1 minute. Add spaghetti and continue cooking over medium to medium-high heat, stirring occasionally, 8 minutes. Reduce heat to medium; add spiralized zucchini. Stir gently and continue simmering until spaghetti is tender yet firm to the bite, 2 or 3 minutes. Reserve about 1/2 cup cooking water. Drain the spaghetti and vegetables. Heat pesto in a pot over medium-low heat; add a few tablespoons of cooking water to thin slightly; stir. Transfer drained spaghetti and vegetables to pot; mix gently to coat with the sauce. Transfer spaghetti to a warmed serving bowl. Drizzle with olive oil; top with grated cheese, red pepper flakes, and pine nuts. Grilled chicken strips are served with spaghetti tossed with veggies and pesto. This is one of those recipes that you dance in joy when you taste it. This incredibly tasty recipe will even delight the skeptical. Very good and easy when you get the zucchini spirals pre-made. We doubled the recipe and fed 6 people including teenagers. I will definitely make this dinner again! Added wilted greens and chanterelles!